TVB drama Life on the Line <跳躍生命線>, featuring Joe Ma (馬德鐘), Kelly Cheung (張曦雯), Moon Lau (劉佩玥), Matthew Ho (何廣沛), Joey Law (羅天宇) and Jeannie Chan (陳瀅), finally came to an end on Friday, November 9. This heart-warming series focuses on the paramedic industry and viewers praised the drama for its successful realism in plot and character development. As the drama reached its final episode, many were concerned that the drama would end tragically. Viewers were concerned about Kelly’s character dying in the final episode from the sudden car accident, in which they thought would be too cruel for Joe’s character to accept again. Luckily, her character survived and had a happy ending with Joe’s character. 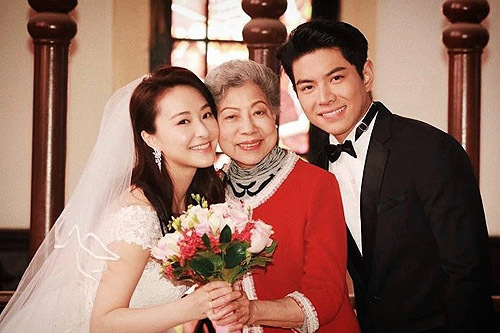 Aside from all the reconciliation between the various couples in the drama, viewers were also concerned about Jeannie’s grandmother in the drama played by Helena Law (羅蘭). Her character saw Jeannie get married before her sickness worsened. Many viewers were pleased with TVB’s fresh and inspiring ending. Rather than a generic ending, Life on the Line finishes with Cheung Kwok Keung’s (張國強) character’s photography laid as a form of memory lane. The photos not only captured each cast member, but also caught shots of paramedical professionals at work. This ending was definitely heart-warming for viewers. After the ending aired, the cast began posting photos on Instagram to celebrate their success. Matthew Ho commented, “I don’t think we’ll separate because our drama has come to an end. Instead, I believe we’ll only become closer.” Kelly shared, “This friendship is forever and I already miss it!” Lastly, Joe Ma thanked viewers for their support and he hopes to see everyone again on screen. This drama shows that TVB can still be competitive and produce good dramas with their new generation of actors, good storyline, and support from experienced/veteran actors who are wiling to come back once in a while to film for the station. Actually having watched a few of non-TVB; Cantonese/Hong Kong series (the latest being Eclipse Storm), i found that there are no huge differences between TVB or non-TVB series. The recently concluded Eclipse Storm also started off well, but became draggy and went downhill towards the ending. Some of the young actors’ performances are also the same if not worse than TVB’s new line of actors. Thus, i still hope that TVB dramas which i’ve been watching at least for three decades until now (despite the many negative comments due to the undeniable drop of quality) will regain its glory. Of course this could only be achieved if the management is willing to accept the fact that they need to make necessary changes in order to stay competitive and survive in the industry.